STEVEN RICHARDS will lead a factory-backed BMW attack on the 2018 Liqui-Moly Bathurst 12 Hour. 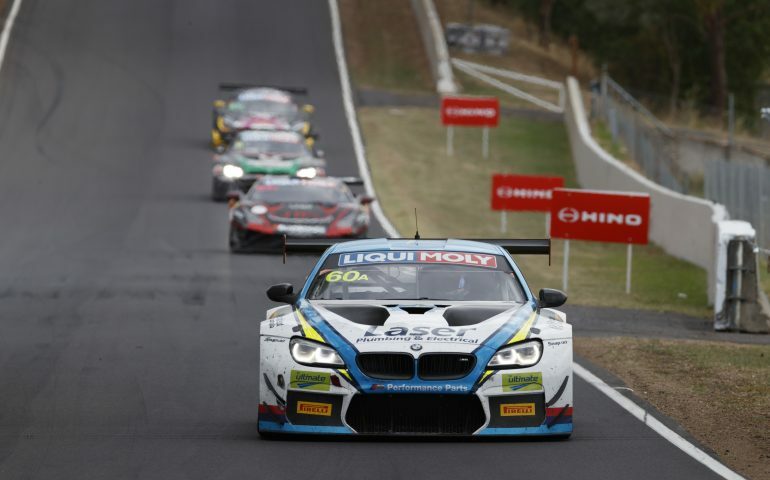 The four-time Bathurst 1000 champion has confirmed that factory BMW drivers Timo Glock and Philipp Eng will join him aboard the Laser Plumbing & Electrical BMW Team SRM M6 GT3 next February. It’s an all-professional line-up that, when coupled with twelve months worth of development and experience with the M6GT3, is likely to make Car No. 100 an outright contender. “You certainly can’t complain when you get a guy who has raced at the highest level and a young star from the factory team to come and drive with you,” Richards told bathurst12hour.com.au. “BMW are great partners in that when their customers commit to a race like this they open the door to some amazing support and driver talent. Richards said the team was ready for a return effort at Australia’s International Enduro after a promising showing in 2017. Though both BMW Team SRM entries had troubled race days – Richards’ car he shared with Marco Wittmann and Mark Winterbottom finished 14th after a series of mechanical issues, while the high profile Mark Skaife, Russell Ingall, Tony Longhurst and Timo Glock entry crashed out after 134 laps – both cars were fast. Both made the shootout in 2017 having placed consistently in the top few throughout practice. “We’ve had another year on track and we have a good handle on the car now,” Richards said. The 27-year-old from Salzburg, Austria, currently races for BMW team Rowe Racing in the Blancpain Endurance Series, having won Porsche Carrera Cup Germany and the Porsche Supercup prior to his GT debut in 2016. Driving with Maxime Martin and Alexander Sims he won the 2016 Spa 24 Hour enduro, while he also notched up a LeMans 24 Hour start the same year in a Dempsey-Proton Racing Porsche 911 RSR. Glock’s career is well documented and included 91 Formula One starts following his victory in the 2007 GP2 championship. He has won four times in the DTM as a BMW factory driver and finished 7th in the 2017 championship after contesting his first Bathurst 12 Hour. The team will confirm driver details for their remaining entries in due course, having earlier this week shown off the first BMW M4 GT4 to arrive in Australia.